Self catering overnight and holiday accommodation. Home of Willow Wren Training. Central to the canal network just south of Rugby in Warwickshire. 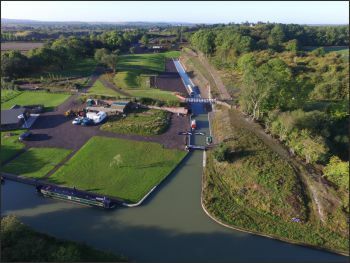 Nelson's Wharf is a peaceful countryside retreat set in beautiful Warwickshire countryside with self catering studio guest rooms and idyllic moorings for narrowboats and cruisers. It is also the home of Willow Wren Training which is the leading canal based RYA and MCA waterways training centre in the country. The wharf comprises a new accommodation block with two self-catering studio guest rooms each with private facilities and a built for purpose training centre with on-line mooring for WWT's three training narrowboats. The main leisure moorings are in the private canal arm leading off the main canal. Since acquiring the land in 2013 we have been busy clearing invasive scrub, repairing the canal bank to moor the Willow Wren Training narrowboats and building an environmentally friendly training centre. The 1870's canal arm was restored and finally opened in October 2017. In Spring 2018, we opened the accommodation building comprising admin office and two studio guest rooms. The wharf is part of a 40 acre estate which used to be the site of the Nelson's Cement Works and quarries which up until the late 1940's produced high quality cement and lime based products. It fell into dereliction until most of the site was demolished in the 1960's. See Nelson's Heritage for more information about the history. The canal was used to bring in coal to power steam engines and electricity generators and to transport finished goods from the site with their own fleet of steam powered motors and unpowered butties. Later, they also used the L&NWR railway which ran through the works and also had a fleet or lorries. Although the remains of structures still exist in places the site has largely reverted to countryside and now also has a Site of Special Scientific Interest, (SSSI). The area is noted for rare butterflies, (such as the Small Blue), and many orchids. Our intentions over the next few years will be to enhance the SSSI under the guidance of the Warwickshire Wildlife Trust and Butterfly Conservation and to manage the extensive woodlands on the estate which in previous years has been allowed to overgrow out of control. See Nelson's Ecology for more information.